The impacts of the urban heat island (UHI) are well documented, including increases in heat-related public health issues, stresses on urban ecology, and energy usage to mitigate the higher temperatures. UHI is of particular concern to cities in the Southwest, since it counteracts the cooling that otherwise normally occurs at night. While UHI mapping and modeling has become more sophisticated in recent years, there is still an information gap between the heat maps and models, urban planning and design strategies to decrease heat, and the use of that information in policy decision making. 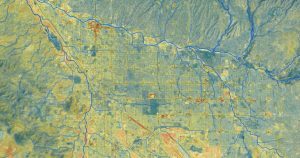 This study focuses on documenting the current use of urban heat maps and models in communities in Arizona and New Mexico and evaluating best practices and opportunities to increase their usability. To expand our network of community partners interested in future collaborative efforts.